From Virgin Atlantic to Virgin Galactic, when it comes to flight, the sky is never the limit for the Virgin family — it’s where we thrive. So we had to ask ourselves, how do we bring our taste for celestial soaring to the sea? Here at Virgin Voyages, we’re excited to announce RockStar Private Jet Transfers. Inspired by the signature red running track on our first ship aptly referred to as, “The Runway”, for ship two we’re expanding the elite RockStar experience for our Sailors while pushing the boundaries of what a “runway” should be. And no, a fashion runway wasn’t going to cut it for our second grand appearance at sea. Unless of course you think private jets should strut — in which case, yes, this is the catwalk to end all catwalks. Using a curved design at the aft of the ship — we’ve engineered a runway large enough to land our private jet and bring our most elite Sailors directly to their voyage. 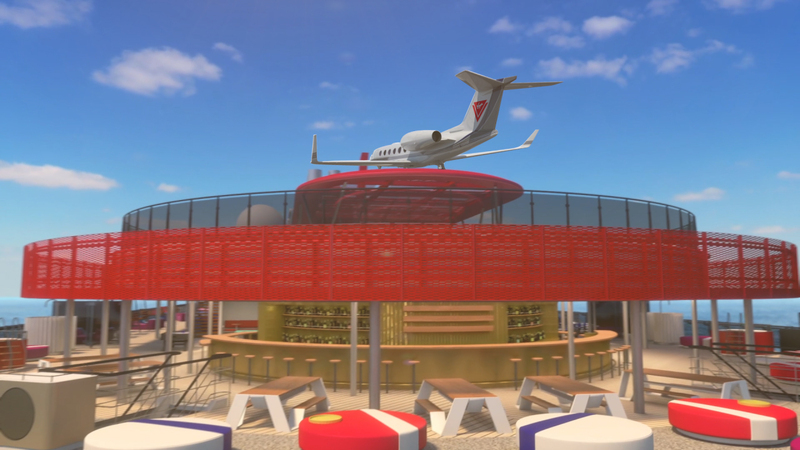 All Sailors with RockStar status will be glamorously piloted from their hometown by way of our Virgin Voyages’ Private Jet. But we didn’t stop with the VIP private jet transfer — RockStar Suites Sailors will be living their best lives with early access to onboard entertainment, restaurants and Shore Things. After stepping off their private jet (no big deal), RockStar Suites Sailors will have their very own wardrobe team to help unpack and repack, complimentary pressing and nightly express swimsuit drying service — leaving RockStar Sailors like rock and roll royalty. With our second ship, we’re challenging ourselves to expand the idea of rebellious luxe; and offering our Sailors the most life-changing experiences whether it be on land, at sea or in the sky.